This is a fun and novel approach to creating and remembering a random full deck stack very easily. The stacks look very random and no pattern is visible - because there is no pattern. There is no need of any brute memorization and also no math is involved. Extremely easy to learn and also, more importantly, extremely easy to recollect. Probably for the first time, numbers are used in a clever way but without using any mathematics. As practical examples of this approach, two new stacks are explained. These are 'The 1260 Stack' and 'The 78 Stack'. The objective here is to create cyclical stacks which have no obvious +3 or +4 patterns like the Si Stebbins or which do not need brute memorization like the 8 Kings stack. After learning this approach, you can even create your own such stacks or simply put to use the 1260 or 78 stacks which are explained. Almost all the stack magic tricks available for Si Stebbins or 8 Kings stacks can be performed with these stacks. These stacks are optimally useful for non-regular or occasional performers of stack magic and beginners in card magic in general, who may not want to invest lot of time and effort into 'acquiring' a new stack initially. Although these stacks are meant to be used as cyclical stacks, with a little extra effort these can also be used as memorized stacks, if required. 'The 8000 Stack' and 'The 700 Stack' are also explained in the 2nd edition. 2nd edition 2016, 11 pages. 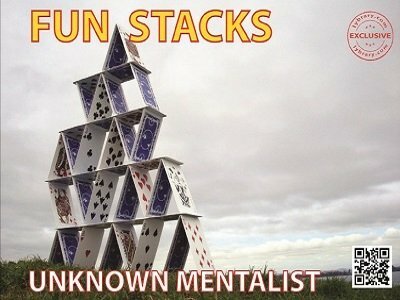 I have known about this type of stack for quite awhile and it is excellent for anyone interested in learning easy stacks which appear to be in a very random order and are easy to learn. Well done UNKNOWN MENTALIST!